Remember how we told you that soon, Cafe World spices would have a larger importance in the game? Apparently Zynga didn't want to make us wait any longer to find out what that announcement meant, as they have released a new feature in the game, allowing you to spice your neighbors' dishes when you visit their cafes. Adding a spice is simple. 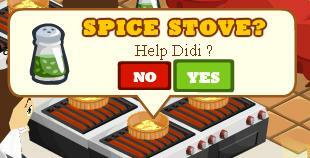 Just click on a stove with a green arrow and select "Yes," that you would like to add some spice. If you choose to add some spice to their dishes, you'll receive the same Cafe Points and coins as if you had gone to their cafe and given one of their recipes a quick taste test (the traditional event that popped up when you visited a friend). Don't worry, you're not using any of your own spices in helping out a friend, so feel free to help as many friends as you like (you can only spice one dish in a cafe at a time). Again, you'll receive Cafe Points and Coins for doing so, and your friends will receive extra servings of the dish in question. Additionally, if you happen to come across some spoiled dishes, you can save them in the same way – sprinkle some spice on top and voila – food that's ready to serve once again. 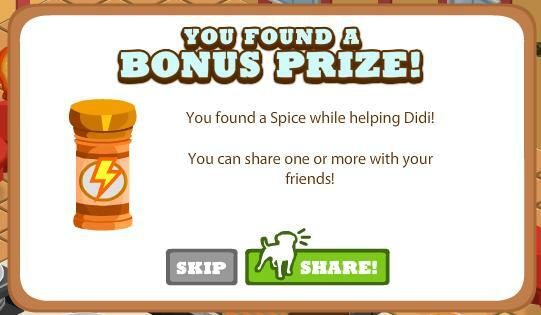 While spicing your friends' dishes, you might come cross bonus items like more spices or spice rack ingredients. These spices and ingredients are the "real" spices, that do count towards your own total and you can share your new discovery of them on your wall as a news item that friends can click to earn more spices or the free spice rack ingredient, if they need it. 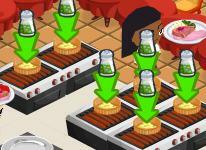 Head over to the game's page to start adding some spice to your Cafe World neighbors' lives. This article originally appeared on Frisky Mongoose.